Unmatched in fit and finish, our timeless French patio doors are a modern classic. Combining traditional design and expert craftsmanship, our energy-efficient French patio doors feature endless design combinations to complement any space. Choose from in-swing or out-swing doors in a variety of styles engineered for years of performance. With super tough PVC-U construction, your frames won’t warp, rot, corrode or fade over time. uPVC French doors create a stylish seamless entrance. Traditionally used to open up living rooms, kitchens or conservatories, the uPVC French door gives unrestricted access to rooms as well as enhancing ventilation and natural light. 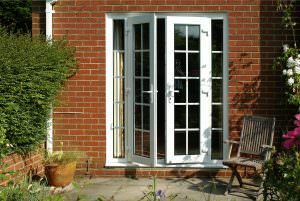 Throughout the summer months your PVC-U French door can be left open to bring in the cool air and fragrance of your garden. While in the winter months, your French doors let the sunshine in, without letting the warmth out. This is down to the design and thermally efficient glazing which you can have installed with the PVC-U doors. Our French patio doors are designed to match the beauty and profile of wood patio doors, but with none of their maintenance headaches. They ward off wind, snow and rain, year after year, without peeling, swelling, expanding, contracting, cracking or warping. They’re impervious to cold, heat, insects, salt air and corrosion.